That race, organized by the Road Runner’s Club and the New York City Parks Department, was run entirely within the confines of Central Park by a small group of runners, most of whom knew each other by first name. (According several participants in the race, there were “some people from out of town” competing as well.) It was announced with little fanfare in a Parks Department press release: “The New York City Marathon has developed from the efforts and enthusiasm of New Yorkers who participated in physical fitness programs and jogging.” No billboards, no TV ads, nothing. ***New York has hosted marathons (varying in route and legitimacy) since the beginning of the 20th century. Many of the early races were run on streets filled with cars and sponsored by local newspapers or manufacturers. Often, employees of the sponsoring companies were paid to participate. In 1909, C.W. Smith, a major in the National Guard, organized the first edition of the Brooklyn-Sea Gate Marathon, which was held in February on Abraham Lincoln’s birthday. 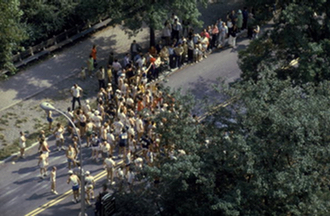 The original route looked similar to a back-and-forth version of the modern Brooklyn Half Marathon, starting at the Park Slope Armory on 14th Street and Eighth Avenue, circling Prospect Park and continuing down Ocean Parkway and around to the entrance of Sea Gate, where the runners turned around. Along along the twenty-five-mile route, starting from the armory at Putnam Avenue and Sumner Avenue to Sea Gate via Coney Island and return, could be seen bare-legged youths caring for their cuts and bruises and being cared for at the various stages where the icy road had caused them to come to grief or the extreme cold had forced them to drop out. … No worse weather conditions have ever prevailed for a Marathon race, and the ten who finished out of the forty-five starters will probably feel the effects of their gruelling contest in more ways than one…There were stretches on the parkway that were covered with ice, and those of the pack that reached these points slipped and fell. They were generally badly cut around the shins and knees, and when they returned to the armory, where the last two miles of the race were completed, their bloody legs presented anything but an inspiring sight. Simon Glenn-Gregg is a Brooklyn-based freelance writer, data visualizer and long-distance runner. He is currently interactive lead at The Century Foundation, a progressive think tank.